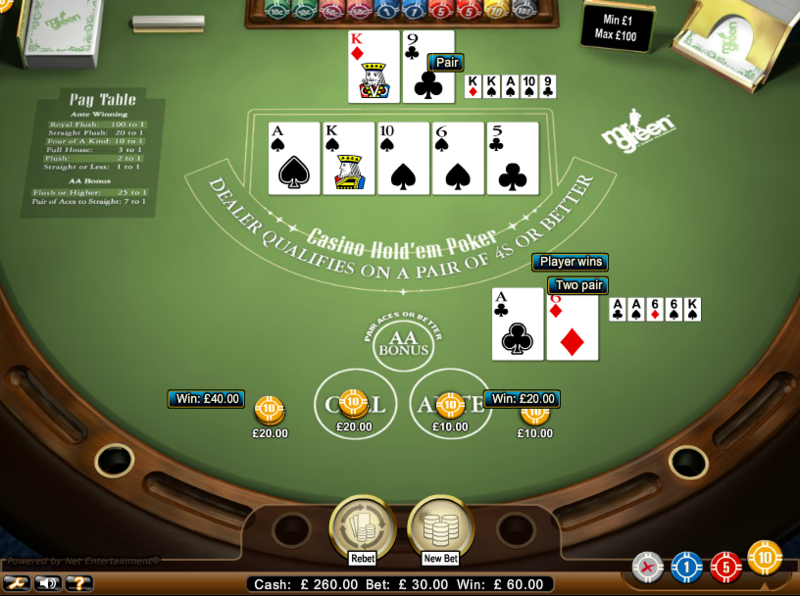 Casino Hold’em Poker is a smooth-looking poker variant from Net Entertainment which offers players a kind of combination between Texas Hold’em and video poker. Gameplay follows the familiar pattern of Texas Hold’em initially but as the hand progresses it becomes an attempt not only to beat the dealer but to maximise your winnings by creating the strongest possible hand according to standard poker rankings. Basically you’re playing this simplified game of Hold’em against the dealer so to begin with you need to select your chip size and place it on the ‘Ante’ circle. This bet can’t be changed but you can also place a bet on the ‘AA Bonus’ circle – this pays if your hand plus the first three community cards contains a Flush or better (pays at 25/1) or Pair of Aces to Straight (7/1). You will see this wager disappear from the table if those conditions are not met. Once you’ve placed your ante and your optional AA Bonus bet, press ‘Deal’ and you will receive two hole cards; three community cards will be placed in the centre. At this point you can choose to fold (in which case you forfeit your ante bet) or Call, which costs 2x your ante. This is a really engaging poker variant which can be quite profitable you play sensibly and know when to fold. We haven’t worked out the stats but experience suggests that the AA Bonus bet should be avoided. There’s a tempting RTP of 98.75%.